• Fast on-site hose replacement. • Mobile repair workshop carrying a full range of hose and connectors up to 2". • Downtime reduced to a minimum. 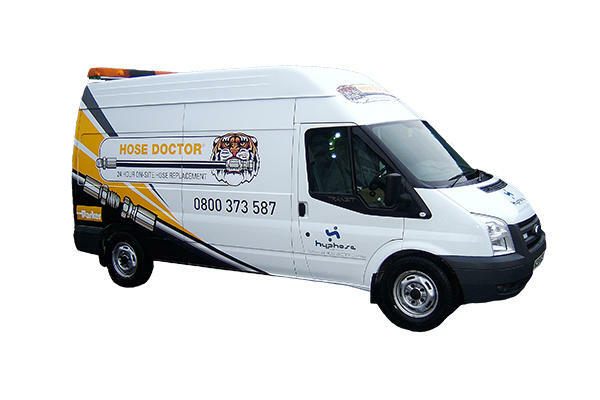 We operate a fleet of HOSE DOCTOR vans which provide a fast on-site replacement hydraulic hose service. Each van is a fully equipped mobile workshop and carries a full range of Parker hose and connectors and can manufacture high-pressure hoses up to two inch bore on site. The Hyphose HOSE DOCTOR vans form the southern arm of the Parker Hose Doctor network that operates across the UK, 24 hours a day, 7 days a week.